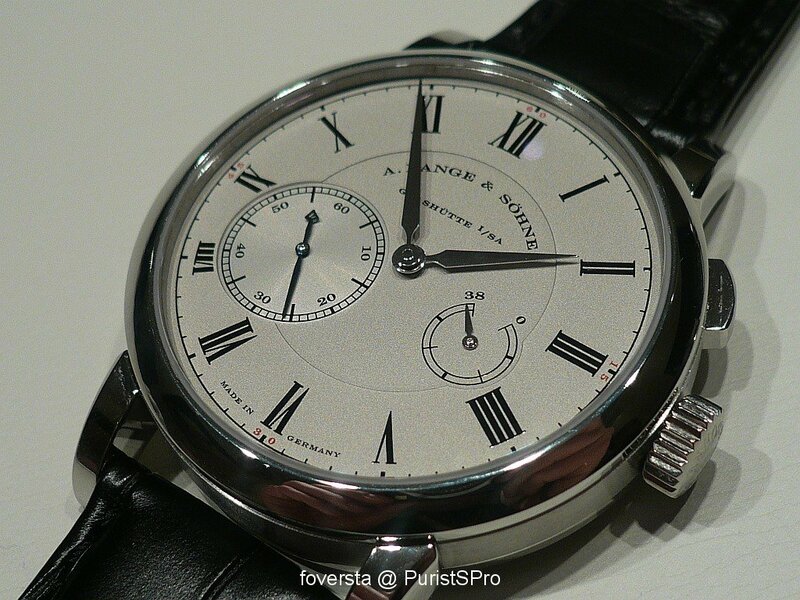 A.Lange & Sohne - Part 5: Richard Lange "Referenzuhr"
Part 5: Richard Lange "Referenzuhr"
The Richard Lange "Referenzuhr" is a LE of 50 pieces in Pt and 75 in PG. The purpose of this watch is to allow to set the time with accuracy thanks to a zero restart function. In order to take advantage of this function, the dial has a big second hand sub-dial. 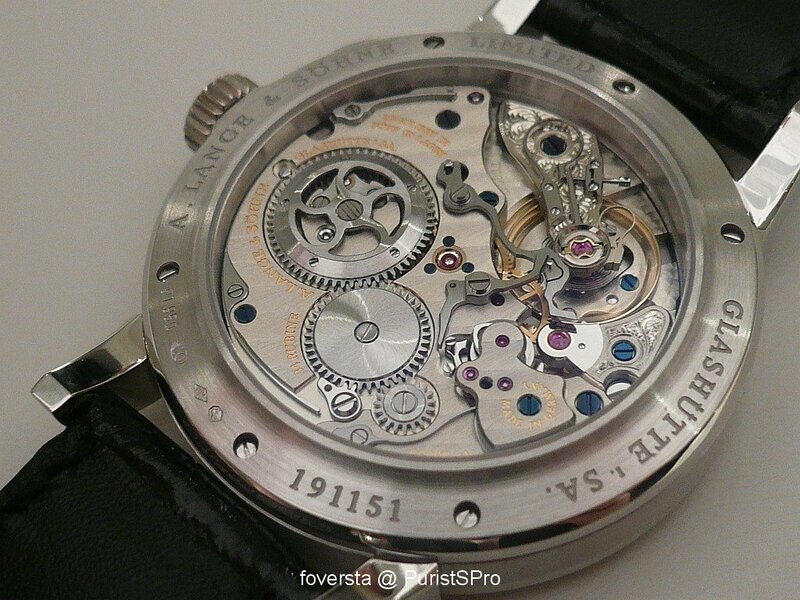 The watch has a case diameter of 40,5mm, a thickness of 11,2mm. You will notice the special architecture of the caliber with the presence of wheels over the 3/4 plate. I must confess I don't like a lot this Richard Lange. The dial seems unbalanced to me due to the small size of the power reserve indicator. What a lovely watch is the 1815 Moonphase! I agree with you, Xavier. The display backs are just unbeatable. Thanks FX for your efforts and report I really appreciate your enthusiasm.Yours,Mo. This great rotor is crazy. In fact, I'am a dunce that copy bad trough your Shoulder FX. Greats pics! I love PR indicators, but this one really did not fit well in the RL. 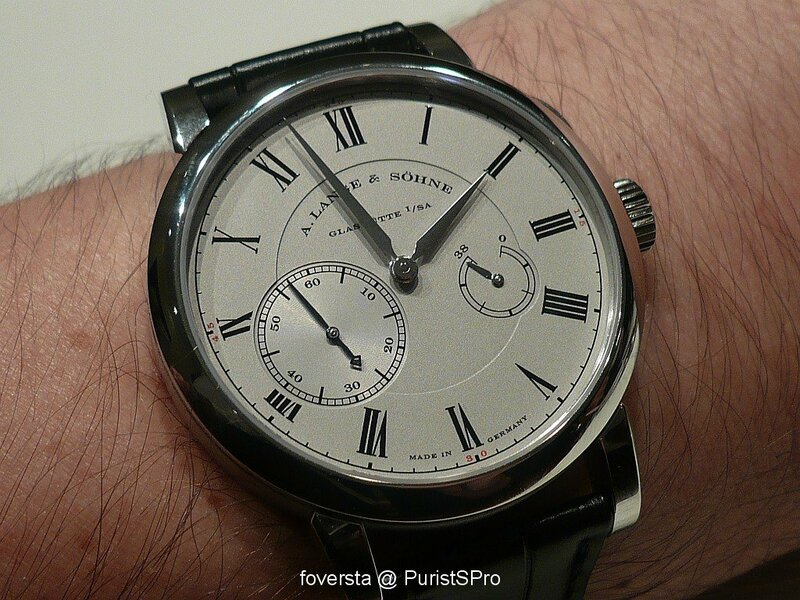 Also, the “real” RL is the ultimate dress watch, IMO. Part 6: For the Ladies ! I just showed my gf these pics. Woah! This I must see in the metal!! also find luminous concept works perfectly in this watch too. PAM348, cause this is interresting watches, but is don't I except from this kind of brands... 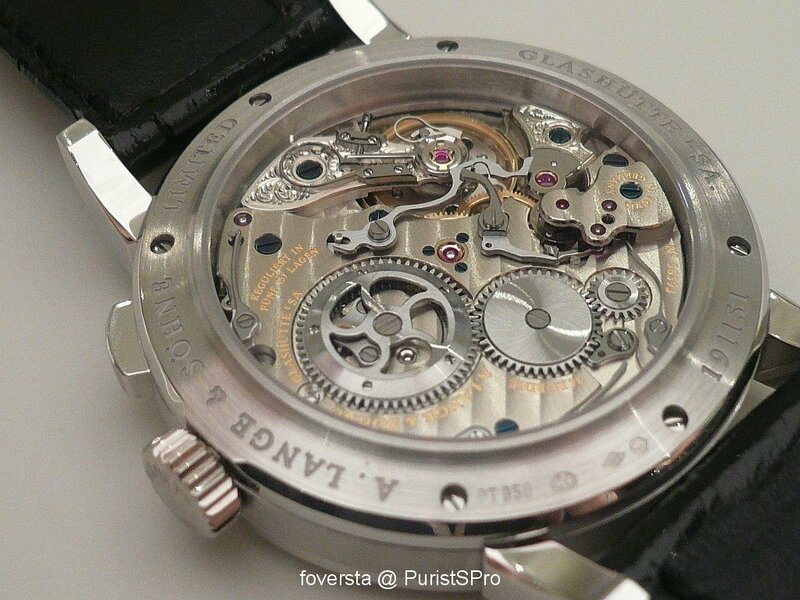 I see that more in independant watchmakers. 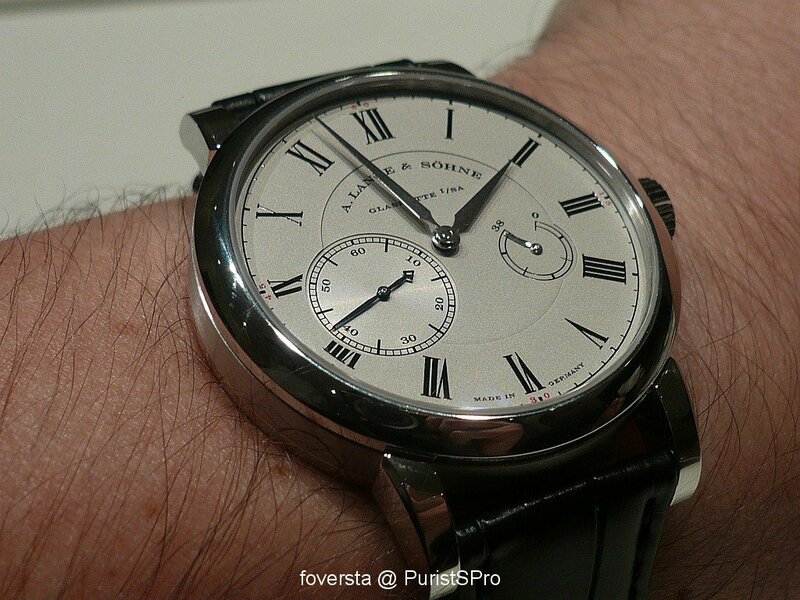 The Grande Lange 1 luminous looks huge on your wrist, Xavier! My conclusions: 1st... Thank you for the gr8 post! Great series of posts, FX! Always a pleasure to read you report and heartfelt comments.Yours,Mo. Great report and fantastic pictures. Thank you. What a comprehensive report FX!! Thanks FX, one the greatest moment of this event. 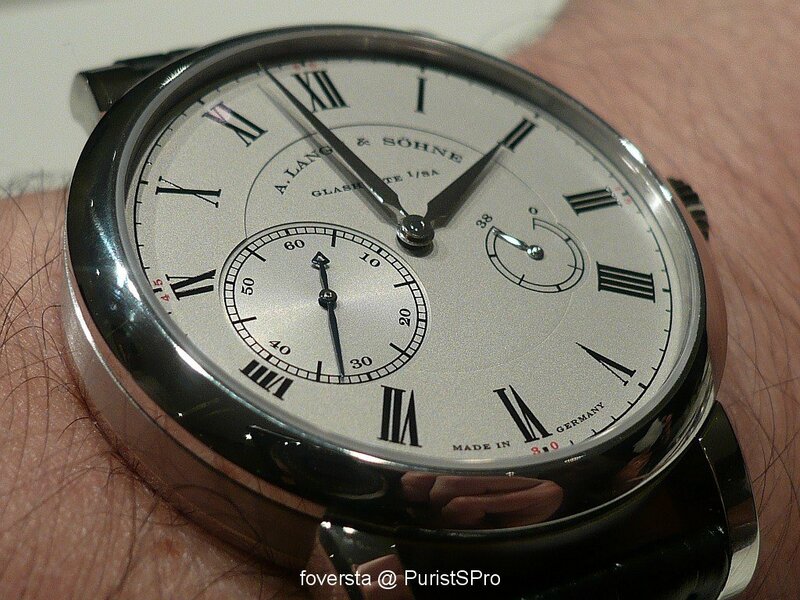 Many Thanks for your excellent report on the 2010 Novelties from our friends at ALS. You have out done your usually above normal reporting! Best regards, -- Richard.